Donald Tsang Yam-kuen, GBM (born 7 October 1944) is a former civil servant who was the second Chief Executive and President of the Executive Council of Hong Kong from 2005 to 2012. Tsang began his civil service career in 1967, occupying various positions in finance and trade in the Hong Kong Civil Service, and was appointed Financial Secretary of Hong Kong in 1995, becoming the first ethnic Chinese to hold the position under British administration. He remained in that position after the transfer of the sovereignty of Hong Kong before being appointed Chief Secretary for Administration after the resignation of Anson Chan. Tsang was praised for his handling of the Hong Kong economy both as Chief Executive in the mid-2000s and as Financial Secretary in the late 1990s. Tsang was made a Knight Commander of the Most Excellent Order of the British Empire in June 1997 hours before the handover. He assumed the office of Chief Executive of Hong Kong in 2005. After his appointment, he was criticised for the government's mishandling of a number of incidents, most notably the demolition of Queen's Pier, Political Appointments System, the Leung Chin-man appointment controversy, and the Employee Retraining Levy waiver controversy. Donald Tsang was born in Hong Kong on 7 October 1944, during the Japanese occupation. His father was an officer of the Royal Hong Kong Police Force, and Tsang is the eldest of the five sons and one daughter. After completing his secondary education at Wah Yan College, Hong Kong, an eminent all male Jesuit school in Hong Kong, in 1964, he worked briefly as a salesman at Pfizer Corporation before joining the civil service. His younger brother Tsang Yam-Pui retired as the Police Commissioner in December 2003, after a career with the police in which he worked his way up to the top job from the rank of Probationary Inspector. His younger sister Katherine Tsang is chairperson of Standard Chartered Bank (Hong Kong). Tsang is a devout Roman Catholic and goes to mass every morning, though his political viewpoints were bluntly criticised at times by Cardinal Joseph Zen, who was the Bishop of Hong Kong during Tsang's term as Chief Executive. Tsang is cousin of Daniel Heung, who resigned as chairman of the Committee on the Promotion of Civic Education for being at the centre of a scandal when the Oriental Daily News revealed on 7 August that he had transformed a warehouse site in Shatin (rented from the government in 1983) into a private residence. Heung resigned from his chairmanship position as a result. Tsang is well known for his preference of wearing bow-ties. His nickname, Bow-Tie Tsang, is widely known among Hongkongers. According to a television interview, this preference started somewhere between 1988–1993, when Tsang's office was adjacent to Deputy Political Adviser Stephen Bradley, who himself wore bow-ties. Tsang felt comfortable with a bow-tie Bradley gave him, saying that its design brings fewer hurdles to its wearer than a necktie. Tsang is well known for keeping koi. He had a pond built for them in the garden of his official residence, Government House, at a cost of HK$300,000. His other hobbies include swimming, bird-watching and hiking. Tsang joined the Hong Kong Civil Service in January 1967, and held positions in many different government departments, ranging from finance, trade to policies relating to the transfer of Hong Kong's sovereignty from the United Kingdom to the People's Republic of China. From 1981 to 1982, Tsang studied in the United States, where he completed a Master of Public Administration at the Kennedy School of Government at Harvard University. He has also received honorary doctorates from the Chinese University of Hong Kong, the Hong Kong Polytechnic University and the University of Hong Kong. He was attached to the Asian Development Bank in Manila in 1977 for a year and worked on water supply and railway development projects in the Philippines and Bangladesh. As Deputy Secretary of the General Duties Branch between 1985 and 1989, Tsang was responsible for the implementation of the Sino-British Joint Declaration and the promotion of the British Nationality Selection Scheme. He served as Director-General of Trade between 1991 and 1993, and was responsible for all facets of trade negotiation and administration affecting Hong Kong. In May 1993, he was promoted to Secretary for the Treasury, where he was responsible for the overall allocation of resources, the taxation system and the cost effectiveness of the Hong Kong government. In September 1995, Tsang was appointed Financial Secretary, becoming the first ethnic Chinese to hold the position. He was made a Knight Commander of the Most Excellent Order of the British Empire (KBE) in 1997 for his long-time service to Hong Kong, and he was knighted by Prince Charles at Government House hours before the handover. Tsang was also awarded the Grand Bauhinia Medal by the Hong Kong Government in June 2002. During his term as Financial Secretary, Hong Kong's public spending grew steadily as public revenue remained robust and government budget in surplus. Public expenditure to GDP rose to as high as 23%, though still the lowest among developed economies. He also approved a raise in civil servants' salaries at the beginning of the Asian economic crisis. The salary raise was finally reversed, aligning civil servants' salaries to 1997 levels. During his six-year tenure, he steered Hong Kong through the Asian financial crisis that swept across the region in 1997 and 1998. He worked with Joseph Yam, chief executive of the Hong Kong Monetary Authority and waged war on speculators attacking the Hong Kong currency peg. On 1 May 2001 former Chief Secretary for Administration Anson Chan resigned, citing personal reasons. Tung then appointed Tsang to become the Chief Secretary and invited a civil service outsider, Antony Leung, to take up the post of Financial Secretary. As Chief Secretary, Tsang ranked second to the then Chief Executive Tung Chee Hwa, advising him on matters of policy and deputising for him during his absence. He was also a member of Tung's inner cabinet, the Executive Council, which is also the highest policy-making body in Hong Kong. He assumed the post of acting Chief Executive when Tung's resignation was approved by the Central People's Government of the People's Republic of China on 12 March 2005. Tsang's identity as a civil servant ended in mid-2002, when the POAS, or ministerial system, was introduced in the territory. He carried on his duty as the Chief Secretary, but was no longer a civil servant. Under the POAS all secretaries are selected by the Chief Executive and do not have to be civil servants. According to the Basic Law, if the Chief Executive resigns, the Chief Secretary will assume the duty as acting Chief Executive for a maximum of six months. At 17:30 (HKT) on 10 March 2005 in Hong Kong, Tung Chee Hwa announced his resignation due to "health problems". The resignation was endorsed by the Central People's Government on 12 March, which also confirmed Tsang as Acting Chief Executive. Tsang then assumed power as head of the Hong Kong government. On the afternoon of 25 May 2005, Tsang resigned as Chief Secretary for Administration, after the Chief Executive Election (Amendment) (Term of Office of the Chief Executive) Bill was passed at the Legislative Council, because of his intention to run for the post of Chief Executive. Financial Secretary Henry Tang took up the post as acting Chief Executive. Tsang's resignation was accepted by the Central People's Government of the People's Republic of China on 1 June 2005. It was always clear that Beijing had already endorsed Tsang as the new Chief Executive and that he would be elected unopposed by the 800 appointed members of the Election Committee on 16 June 2005. He was formally appointed by the Central People's Government as the Chief Executive on 21 June 2005. However, an interpretation of the Basic Law by the Standing Committee of the National People's Congress made it clear that Tsang would only serve out the remaining two years of Tung Chee Hwa's term, rather than the full five years originally mooted. In 2007, he was re-elected by the appointed Election Committee for a full five-year term. Mr Michael Suen, the Secretary for Housing, Planning and Lands, became Acting Chief Secretary for Administration as soon as Tsang's resignation was accepted by the Central People's Government. David Li Kwok-po acted as his election campaign manager. Tsang stood on a platform of "Resolute, pragmatic action". On 15 June, he handed in his nomination form which bore the signatures of 674 of the approximately 800 members of Election Committee which the Returning Officer determined that his nomination was valid. Two other would-be contenders failed to gain the necessary 100 election committee members' endorsements, and their nominations were declared invalid, leaving Tsang unopposed. On 21 June 2005, Tsang was officially appointed Chief Executive of the HKSAR by the State Council of the Central People's Government to complete the remainder of Tung's term, which ended on 30 June 2007. During the Chief Executive election campaign, Donald Tsang received about HK$27.33 million in campaign sponsorship, but spent only HK$4.12 million. The remaining HK$23.21 million was donated to 14 charitable organisations. Tsang has said that when his second term finished he and his family would leave Hong Kong. Tsang became embroiled in a junket controversy in 2012, towards the end of his term of office after the media reported he had accepted hospitality from tycoons for travel and lodging. These were made possible due to the lack of established guidelines on gifts and hospitality for the Chief Executive, although these existed for civil servants and political appointees. There were also allegations of preferential allocation of a luxury apartment for Tsang post-retirement in exchange for granting of a broadcasting licence. He left office under the cloud of an investigation by the Independent Commission Against Corruption. Tsang was charged two counts of misconduct in public office on 5 Oct 2015 by the Independent Commission Against Corruption (ICAC). The High Court, approving the prosecutors’ request, ruled that Tsang should face an extra count of accepting an advantage from an agent for violating the Prevention of Bribery Ordinance, in addition to the two charges Hong Kong’s former chief executive is already facing on 11 Oct 2016. ↑ "A Rarity in Hong Kong: Budget Is in Deficit". New York Times. Reuters. 7 March 1996. Retrieved 11 July 2012. ↑ Tsang was a Commonwealth citizen (specifically, British Dependent Territories Citizen) at the time his honour was conferred, so his membership in the Most Excellent Order of the British Empire is substantive and not honorary. Although an ordinary KBE is entitled to style himself as 'Sir', Tsang did not use the title in his official capacity ,. Like other Hong Kong officials, he appeared on Hong Kong Government publications and websites as "The Honourable Donald TSANG, GBM" without the title 'Sir' . 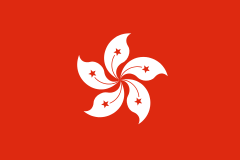 The British Government states it has no policy on the use of Donald Tsang's title, which derives from the KBE status awarded to him in 1997 for his 30-year service to Hong Kong and that it is for the individual concerned to decide whether they use or wish to be known by their title. .
↑ Hong Kong Basic Law, Chapter IV, Section 1, Article 53. Retrieved on 20 February 2007. ↑ SARG Statement on Resignation of CS, Hong Kong government press release, 25 May 2005. Retrieved on 20 February 2007. ↑ Nomination for Chief Executive Election ruled valid, Hong Kong government press release, 15 June 2005. Retrieved on 20 February 2007. ↑ "HK chief executive forced to apologize". Miranda Shek. Global Times. 2012-03-02. Retrieved 2013-07-25. ↑ "Hong Kong's Tsang faces corruption probe". Enid Tsui. Financial Times. 2012-02-29. Retrieved 2013-07-25. ↑ "Hong Kong ICAC - Press Releases - Ex-Chief Executive Donald Tsang Yam-kuen faces charges of misconduct". www.icac.org.hk. Retrieved 2015-10-05. ↑ "Former Hong Kong leader Donald Tsang faces additional bribery charge over Shenzhen penthouse". South China Morning Post. Retrieved 2016-10-11. 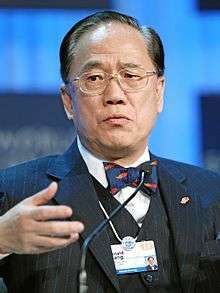 Wikimedia Commons has media related to Donald Tsang.